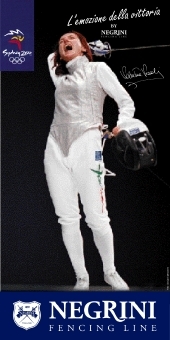 Vezzali (Women's Foil), 21 x 45. Taken at the Sydney Olympics. Big, colorful, intense and inspiring, these are a must for the competitive fencer. Rota (Men's Epee), 21 x 45. Taken at the Sydney Olympics. Big, colorful, intense and inspiring, these are a must for the competitive fencer. Zennaro (Men's Foil), 21 x 45. Taken at the Sydney Olympics. Big, colorful, intense and inspiring, these are a must for the competitive fencer.